Is A Dog Park For Downtown The Right Move? 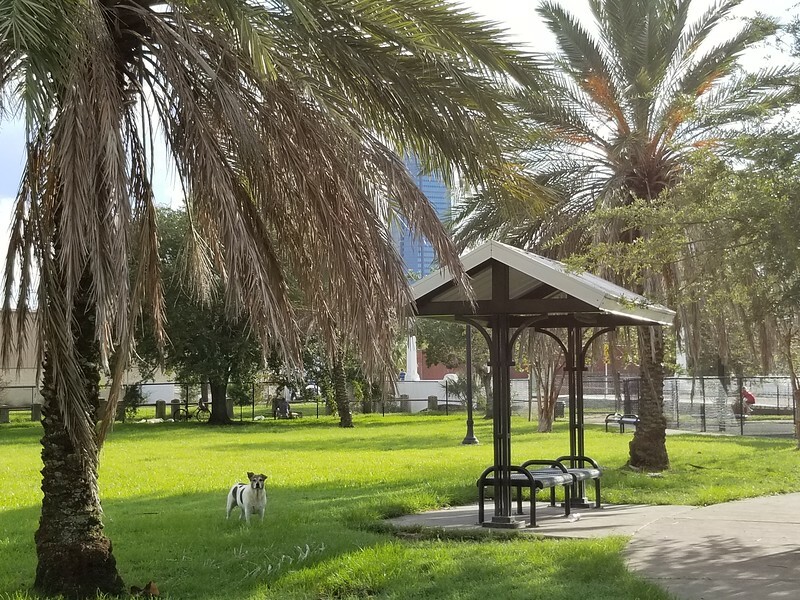 As first reported by the Daily Record, the City of Jacksonville is moving forward with plans to convert the Main Street Pocket Park into a fenced-in dog park at a cost of $400,000. Preliminary design plans call for the installation of 20,000 square feet of synthetic turf, aluminum fencing and gates, pavers, irrigation, a drinking fountain and various pieces of play equipment for dogs. The City’s Parks Department expects that the final design and construction of the dog park conversion is expected to take 18 months to complete. While residential buildings within Downtown’s Northbank are operating near full occupancy, the Northbank’s actual residential population is still quite small when compared to nearby intown neighborhoods like Riverside and Springfield. This is important to note as both neighborhoods already feature new and well-maintained dog parks, with Springfield’s dog park being located only six blocks from the Main Street Pocket Park. It would appear then that the City’s willingness to spend nearly half a million dollars on the dog park conversion has more to do with a Hail Mary-effort at chasing out the homeless population that now congregates within the space, and less to do with allocating taxpayer money in the most efficient way. Main Street Pocket Park is located less than a 10 minute walk from the dog park in Springfield’s Confederate Park. Confederate Park was first opened in 1907, and featured The Confederate Playground (pictured). In 2008, a portion of Confederate Playground was converted into a dog park for the pets of urban core residents. In 2016, the playground equipment received a substantial upgrade. Riverside’s John Gorrie Dog Park was opened in 2016, within Riverside Park. The dog park’s construction was partially funded by private donations and a private group of volunteers maintain and fundraise for the park’s continued upkeep. The ill-fated Main Street Pocket Park, located adjacent to the Salvation Army and a one-block walk to the Saint Francis Soup Kitchen, is mainly populated with underemployed, transient and homeless individuals. Motorists passing by along busy Main Street encounter several scenes of vagrancy stretching along a five-block area starting from the Shell gas station on the corner of Union and Main Streets up to the Main Street Pocket Park. 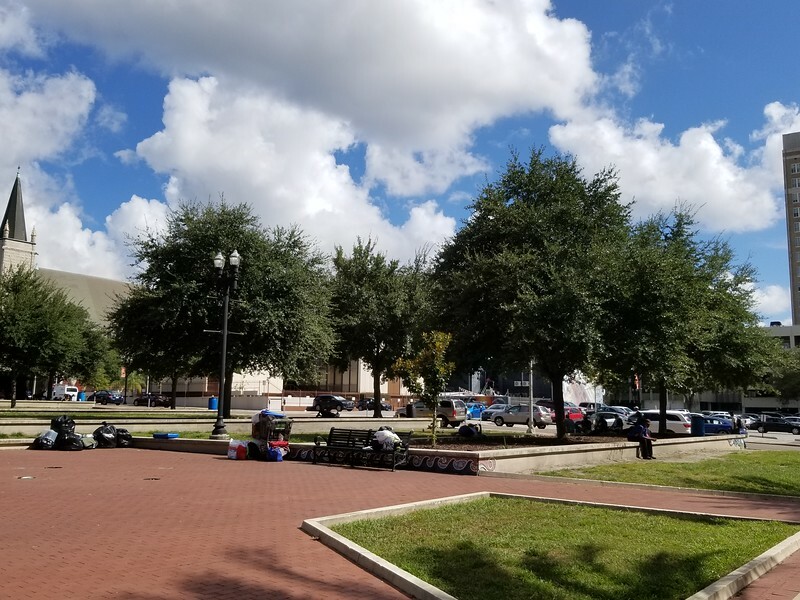 Nearby, the Friends of Hemming Park spends roughly $12,000 monthly for armed security guards to patrol the 1.6-acre public park. 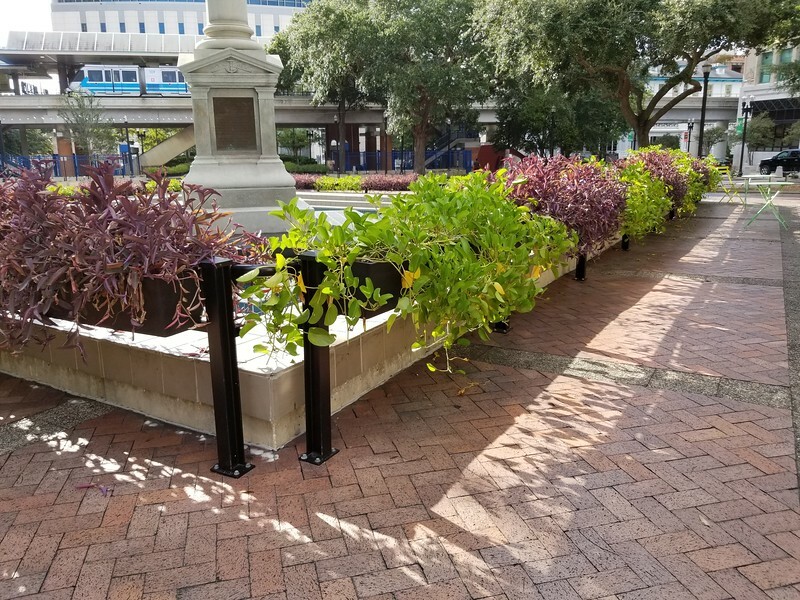 In 2017, the City spent another $175,000 for capital improvements that modified all hardscape features within the park in order to eliminate permanent (formal and informal) seating areas. 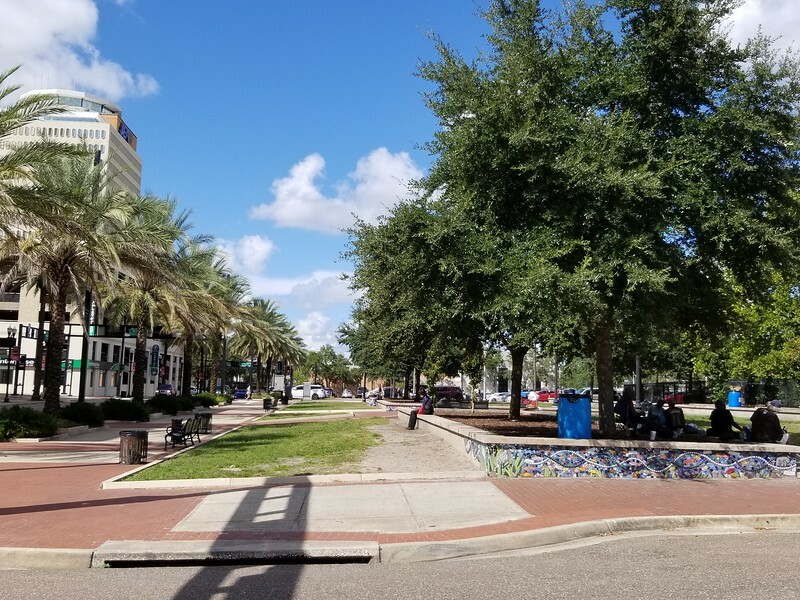 These efforts have largely pushed the homeless and transient population away from Hemming Park, to the next logical location- a passive park featuring no programming that is surrounded with no active, street-level retail frontages. The City’s latest effort to convert the Main Street Pocket Park into a dog park doubles down on previous short-sighted decisions more than a decade earlier. The existence of the park was the result of a $1.8million Main Street Hardscaping and Beautification plan put forth under former Mayor John Peyton. The park, completed in July 2007 at a cost of $700,000, replaced a surface parking lot with a series of grass terraces lined with shade oak trees, lighting and a courtyard. The pocket park’s creation was touted as a cost-effective way to create downtown greenspace, falsely proclaiming that its proximity to the Main Library would make it a popular place for library users and residents looking for greenspace in a sea of concrete. In 2005, downtown advocates raised concerns to the Jacksonville Economic Development Commission (the pre-cursor to the Downtown Investment Authority) that the park’s design would unnecessarily waste public money and create an isolated island of green space that would do nothing but attract vagrants. 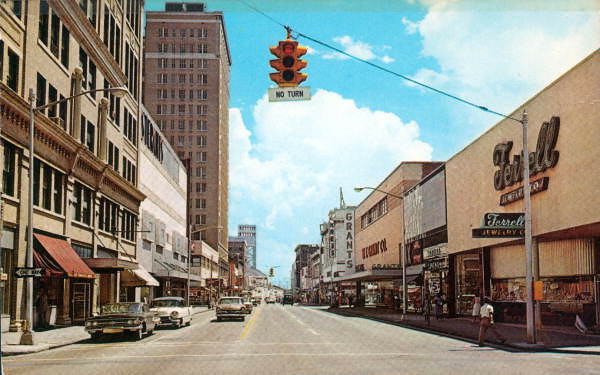 This use would help reestablish Main Street’s importance as a “Main Street” for downtown, as well as provide a concrete location for bringing affordable housing and or retail and business space downtown. The current design plan also has not taken into consideration that the Vagrancy and Criminal element situation downtown is still a very real problem. Surrounding the proposed park are the Salvation Army, Trinity Rescue Mission, Clara White Mission, as well as a day labor facility. 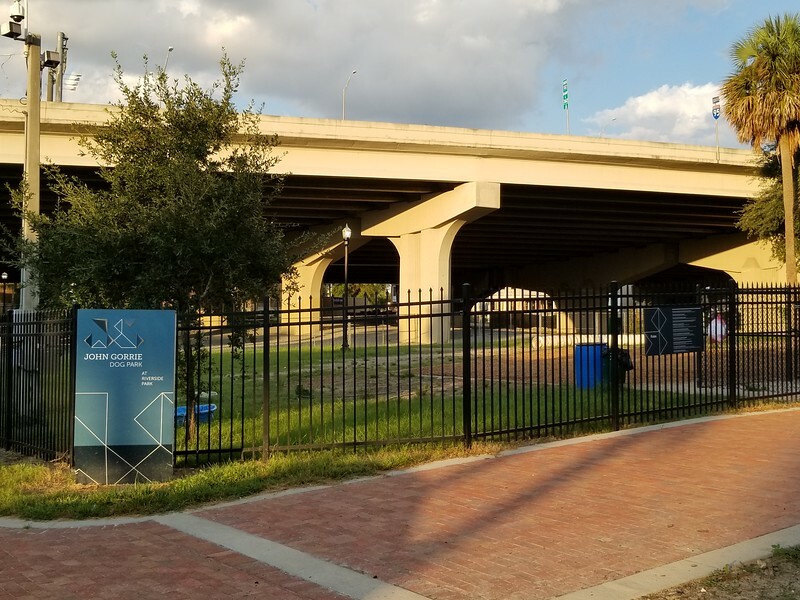 Clearly this park would become an additional magnet to many of Jacksonville’s most at-risk residents, requiring even more dependency on the Sherrifs office to maintain it as a pedestrian friendly green space. 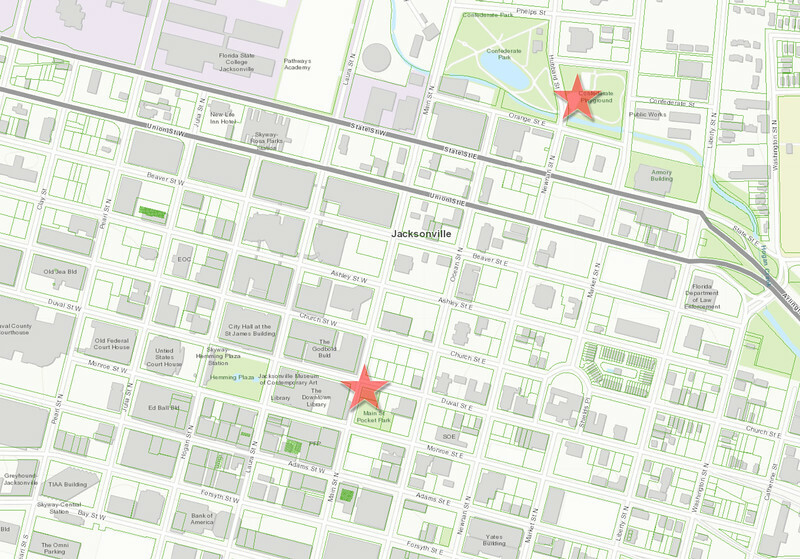 Lastly, with Hemming Plaza being a mere block from the proposed site, and Confederate and Klutho Parks, and the soon to be constructed Hogan’s Creek Greenway within a few blocks, the need for another public park in this location is simply not there. The state of the aforementioned parks show that the city has a history of not maintaining its parks, and adding the burden of another park simply takes money away from existing parks that badly need maintenance. When the Main Street Pocket Park opened, then-Mayor Peyton was absolutely correct in that dramatic and immediate impacts can be experienced while spending minimal dollars, but only if those decisions are viewed within a holistic and contextually-sensitive lens. The strenuous concerns raised, and subsequently ignored, in 2005 have certainly come home to roost in 2018. 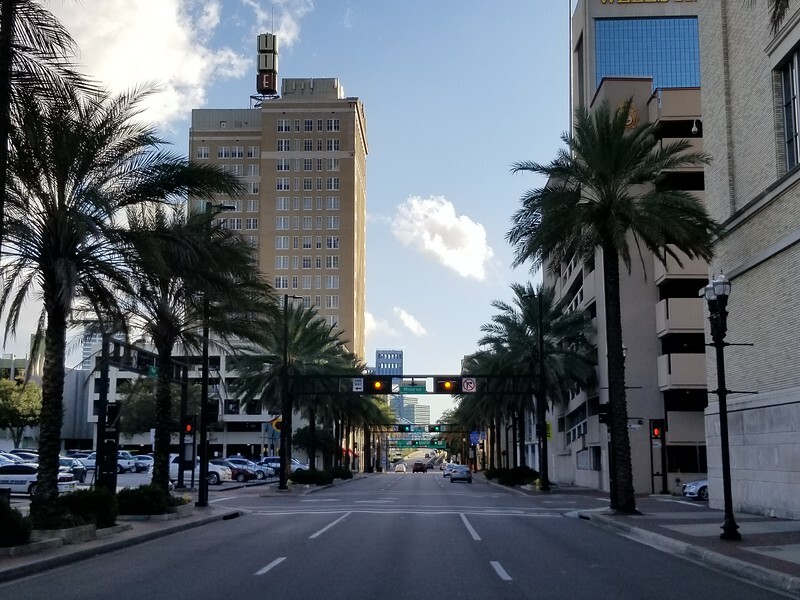 Seemingly not having learned from the mistakes of the past, the City is once again ignoring alternatives brought forward from downtown advocates -opting instead to spend additional money on a use that will struggle to attract desired results. 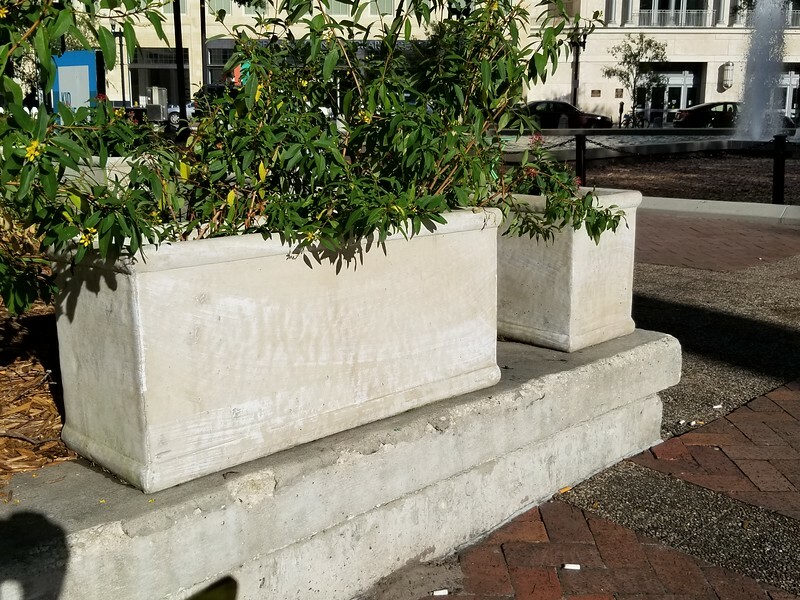 In 2016 Councilman Bill Gulliford, in response to minimal skateboard damage on a portion of City Hall, introduced legislation that would have banned skateboarding in several areas downtown- including sidewalks, walkways, benches and guardrails. 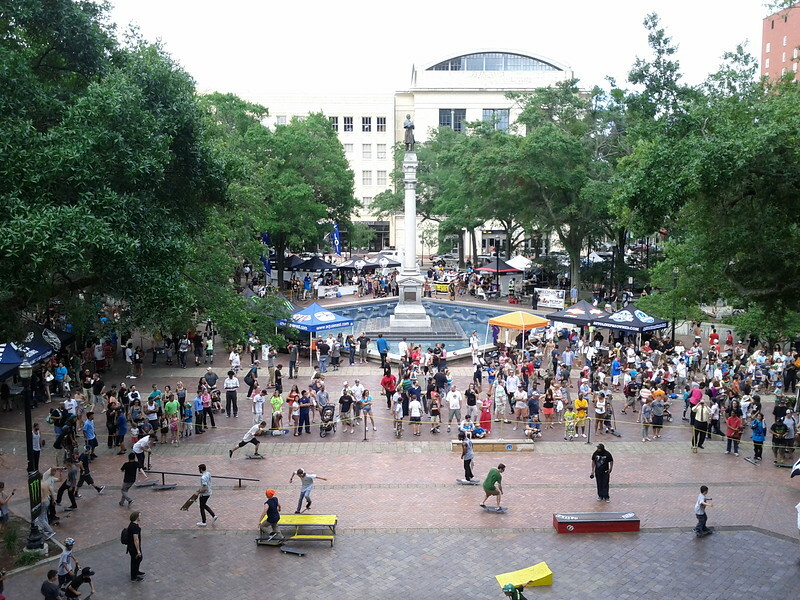 The potential to ban skateboarding downtown prompted the skateboarding community to descend on City Hall, which resulted in a series of public meetings and a proposal put forth for citizen volunteers to develop and maintain vacant city lots as mini skate parks. The Main Street Pocket Park served as ground zero for that discussion. These talks advanced so far, that Councilman Gulliford would withdrawal his legislation in 2017. 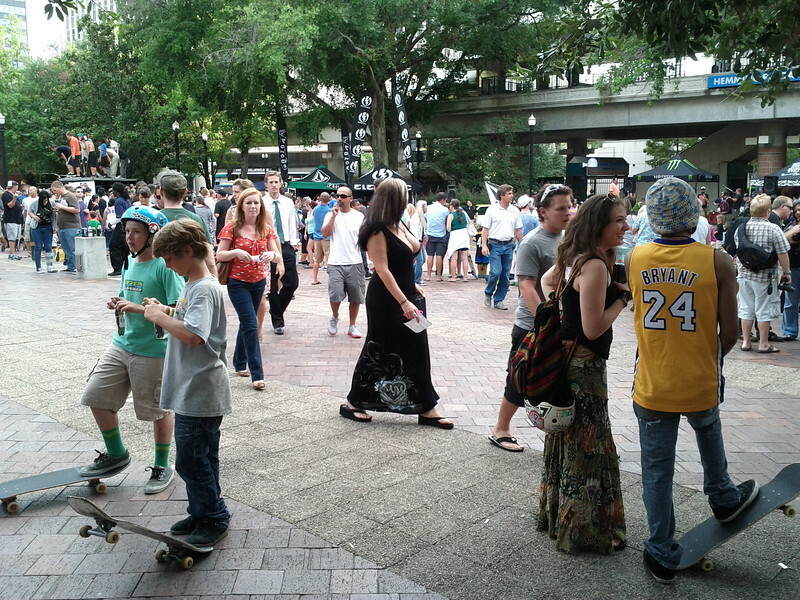 Held annually from 2012 through 2015, Go Skate Day drew thousands of children, parents and adults into Hemming Park. 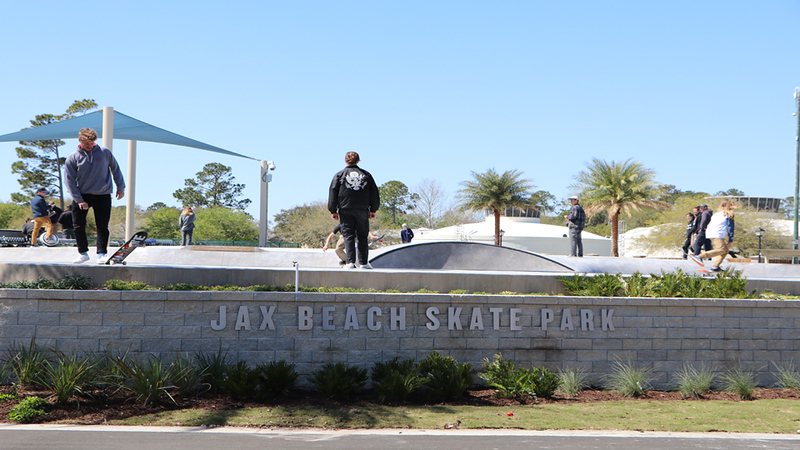 The Jax Beach Skate Park, pictured here, opened in 2017. Frequented by both adults and children seven days a week from dusk until dawn, Jacksonville Beach officials noted that one of the most crucial decision points on whether to open the park came down to the fact that the skating community has a strong tendency to maintain and police these types of park themselves- acting as a ‘force multiplier’ in regards to maintating regular programming and cleanliness. Image courtesy of Team Pain. Yet, those efforts along with a plan by the City’s Parks Department to build a skate park on top of old tennis courts at Florida Dwight Memorial Park near the LaVilla School of the Arts, were halted in favor of a plan to erect a fence around Main Street Pocket Park to be used as a ‘dog park’. Decisions should not be made in a vacuum. Over the last three decades, the City has directed more than enough public money to effectively revitalize downtown. Yet, the disjointed and haphazard decisions on how those dollars have been allocated reveal why the volume of public funds spent have not resulted in the desired level of vibrancy. The story of the Main Street Pocket Park illustrates the importance of planning and implementing a vision over an extended period of time, while simultaneously highlighting why downtown struggles with pockmarks of blighted conditions because of poor designs, a reluctance to cluster complementary uses in a compact setting, and short-sighted decisions guised as ‘political wins’.